Walking conditions – Boots required. Some sections through the gorge require sure-footedness as they are a little awkward in places. Some precipitous drops close to footpath. 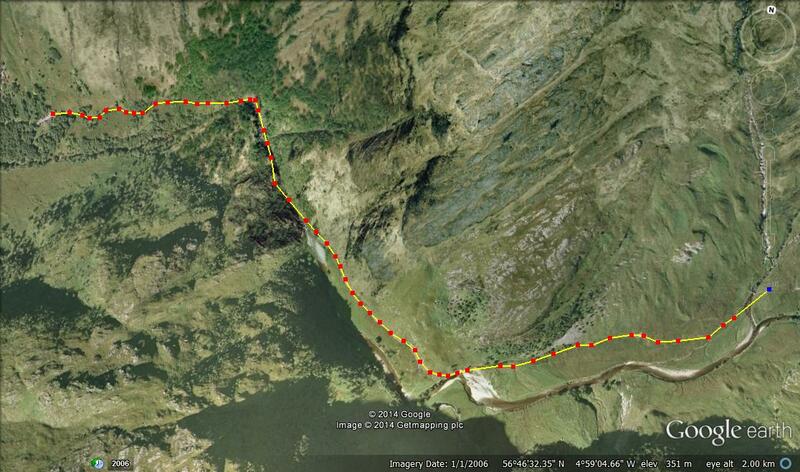 The first time I passed through the Nevis Gorge I was with a friend on route to Meanach Bothy. It was late at night, very dark and icy underfoot. Soon after negotiating this gorge we decided to stop and pitch a tent for the night. Unfortunately, it was my brand new tent and I hadn’t read the instructions on how to set it up. Embarrassingly, my friend and I, both tired and weary took the easy option of wrapping the tent around ourselves convinced we’d still get a good night’s sleep. We woke up in the early hours of the next day covered in snow. If I ever buy another tent I will not make this mistake again! Driving along the single track road through Glen Nevis you will eventually reach an abrupt end to this road. That is where the footpath through the gorge begins. You will immediately be aware of the danger warning signs at the point of entering this path. Take heed of them but don’t necessarily be put off visiting the gorge. But please note: If you have small children, keep a tight hold of them as there are a few treacherous drops only a couple feet from the footpath. The rewards are great. After working your way through around 400 metres of a narrow gorge walk the landscape opens up into a magnificent gallery of mountains, waterfalls and a winding river. We normally walk through this wonderful setting for about a 1.5 Km to the Steall ruins next to the bridge. 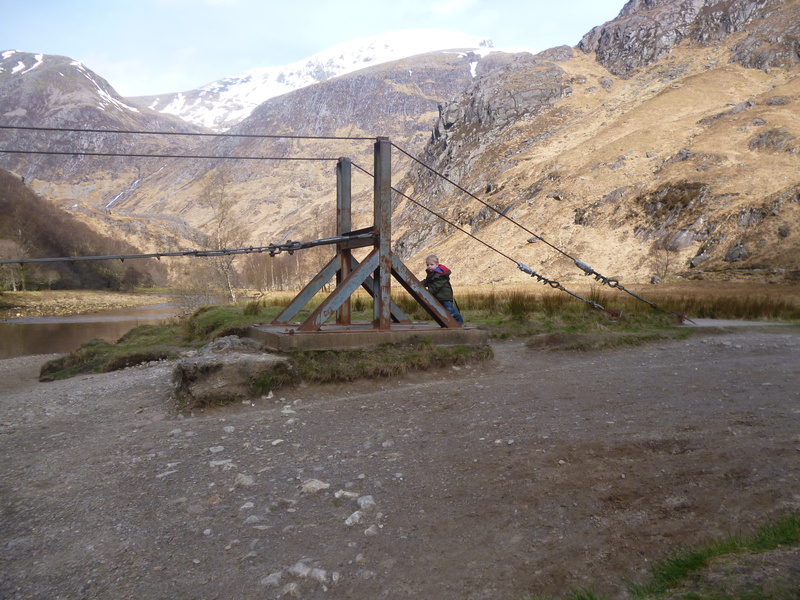 However, the last time we came here, we could not resist the lure of the Burma bridge across the river Nevis, not to mention the spectacular view of the Steall Falls for our picnic location. I’m not one to brag but I successfully negotiated the Burma Bridge because I like to show off in front of the children. On this occasion there were no serious consequences. This entry was posted in West Highlands and Argyll and tagged Gorge walks, Waterfall on September 27, 2014 by scotlandwalkswithchildren.